Everton forward Kevin Mirallas will miss the rest of the season after suffering a groin injury against Manchester United on Sunday. The Belgium international scored in the 2-0 win at Goodison Park before limping off towards the end. Toffees boss Roberto Martinez said: "It's a real disappointment and shame. He was in a phenomenal moment of form." Despite missing the final three league matches, Mirallas will be available for the World Cup this summer. 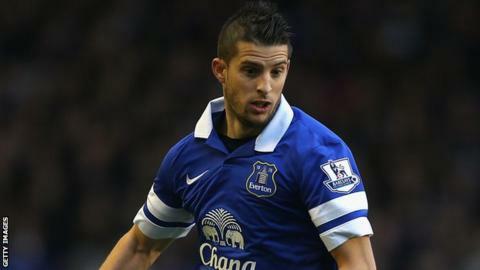 Mirallas, signed from Olympiakos in 2012 and has played 37 games for the club this season, scoring eight goals. The 26-year-old will not be available for the Toffees' remaining games against Southampton, Manchester City and Hull City. Martinez added: "It is not a major injury. It could be anything up to five or six weeks, and that's looking at the worst-case scenario. "The most important aspect now is that we get him fully fit and ready to participate with Belgium in the World Cup." Mirallas had scored three goals in his last four appearances to help his side's push for a Champions League place. Everton trail fourth-placed Arsenal by a point.